Curious titles such as “Zum Rappen” and “Courtyard of the Crow” can only be applied to somewhere of great age. 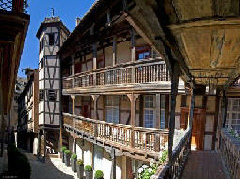 And so it is with this exquisite example of Alsatian timber-frame architecture. Records show its existence in 1528, but parts of the property may be even older. As such, it has played host to a few historic European notables, including kings, emperors, and dukes such as the Duke of Bavaria in 1570 and Joseph II of Germany.